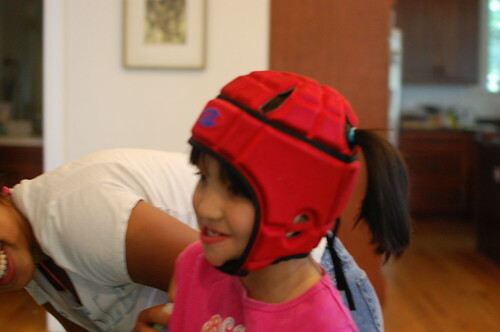 After a few nasty falls, we finally decided to put a helmet on Edda. 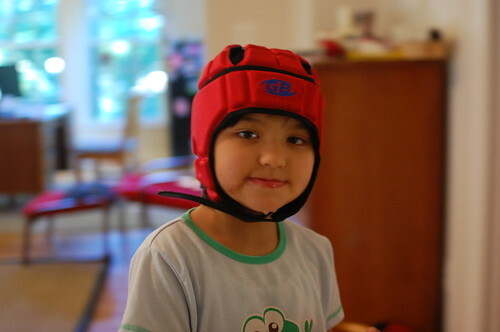 I've been avoiding the helmet strictly based on vanity (which may get me docked points on my parenting report card) because nothing screams DISABLED more than a helmeted head. But I guess safety trumps vanity in the end. Edda spends a lot of the day pacing the house and a lot of the time, we are in the same general vicinity of her, but certainly not close enough to catch her when she falls. I've tried to keep the pacing area clean (difficult for my messy tribe), (small toys esp. the ones with wheels, misplaced shoes and the sleeping dog are all hazards), but sometimes Edda just stumbles over her own two feet or misses an attempt to sit on the couch and bonkers her head. And often enough, we (or the school staff) are shadowing her (right next to her side) and she tumbles and even though theoretically one could catch her, it is actually pretty hard to have the lightning reflexes necessary to catch her each time. And as she grows taller and heavier, she the falls are getting harder on her poor head. As soon as we decided that vanity was not going to win out, we stuck a Dora bike helmet on her while we decided which helmet to order. We searched for a helmet that wasn't too ugly, too big, or too expensive and we found, the Playmaker Headgear. We found it on Rehabmart for $81.86 - down 36% from $126.06, we found it on Amazon for $50 - but Jeremy wanted it in red in size small. We finally called the manufacturer, Playmaker, and explained the situation and they had it in stock and were willing to sell it to us for $37! And they upgraded shipping for us! Awesome company :). How cool are we with our head protection? Damn cool. Edda you could make anything look beautiful girl!! You should send this photo to vogue, what a new style she made!! Hey I wear my pony tail outside my baseball cap. You better not laugh at me for that look! BTW Edda looks darling.